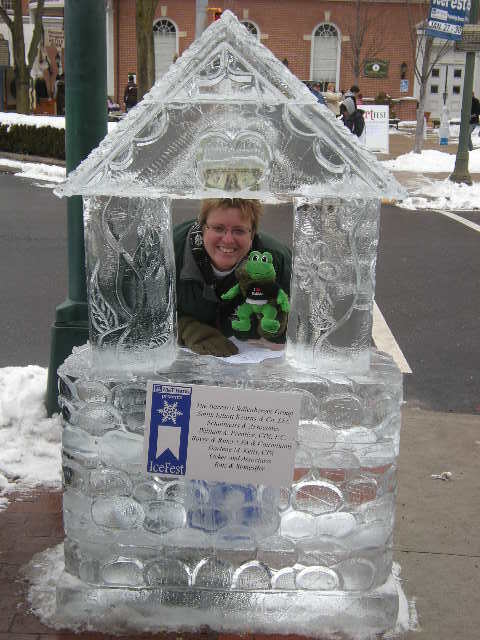 Debbie, Candee, and I recently attended IceFest 2011 in Downtown Chambersburg, Pennsylvania. This was it’s 9th year and is run over a four day period in January. 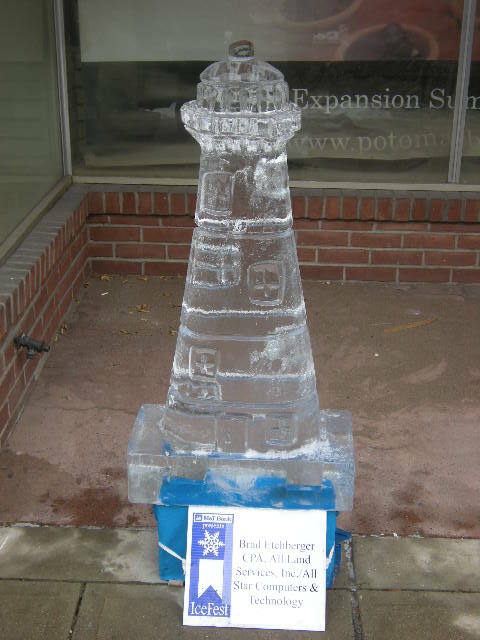 Amazing sculptures are carved from blocks of ice using chain saws, propane torches and hand tools, by carving masters. You can actually see live sculpture carving during the first two days of the festival. Unfortunately, we missed seeing the live carving, but were still able to enjoy the beautiful products of their efforts. I can't wait to make a wish! 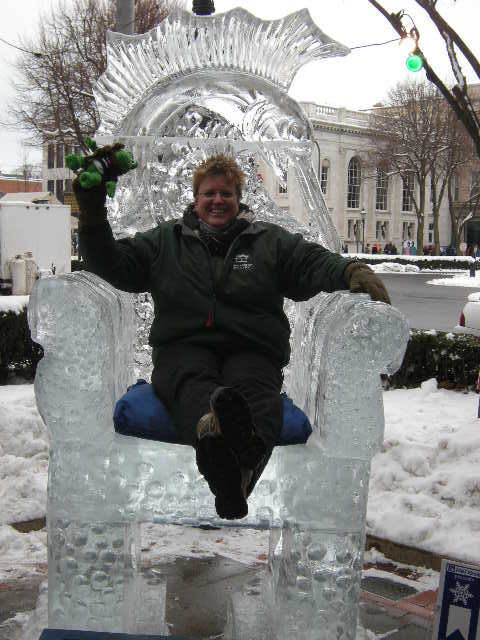 Some of the highlights include the sixth annual chili cook-off, hot pepper eating contest, fireworks, photo ops on the giant Royal Throne, ballroom dancing, art and much more! Many events are free, while there is a modest fee charged for some of them. Some of the local businesses sponsor giveaways like popcorn, hot chocolate, and more. Candee and I went flying down the Ice Slide and it was a lot of fun! 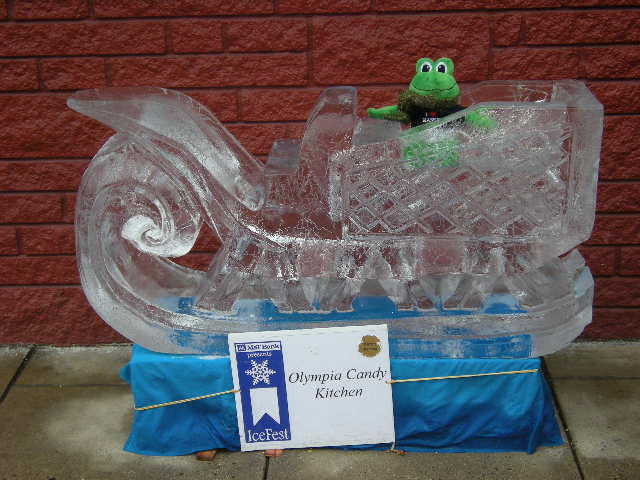 The first Icefest was in 2003, and there were twenty sculptures carved that year. 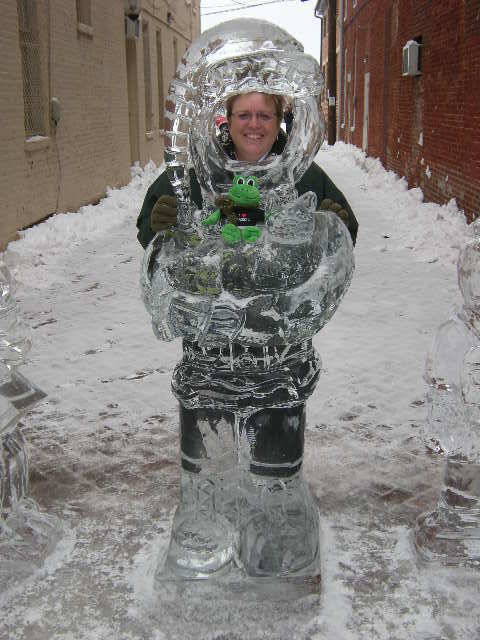 In 2011, there were sixty sculptures planned for the event. Just the perfect size for a frog! Thousands of people come to the event which has now become a major regional event. 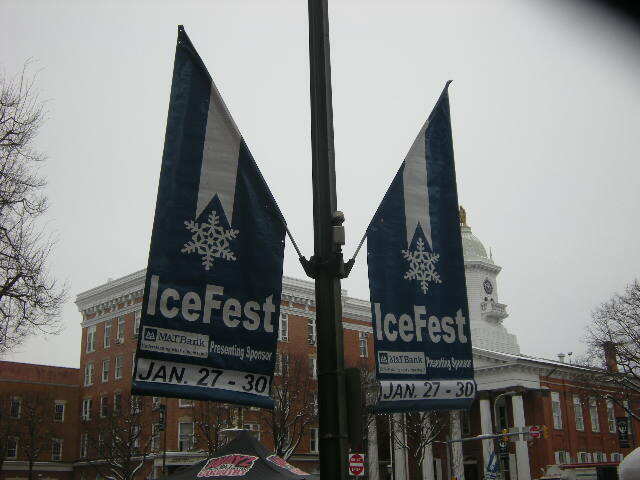 According to the IceFest website, Icefest originated with Downtown Chambersburg, Inc. and Council for the Arts to provide downtown winter events and arts programming for the community to benefit Historic Downtown Chambersburg revitalization and the greater region. The three of us had a great time looking at all of the sculptures which ranged from animals, to flowers, a pretzel, sleighs, a wishing well, and even a large throne. Candee, the Ice Queen and Polly, the Ice Princess! I hope we’re able to go again next year, and I can’t wait to see what sculptures they come up with then. This giant pretzel was one of our favorite sculptures! 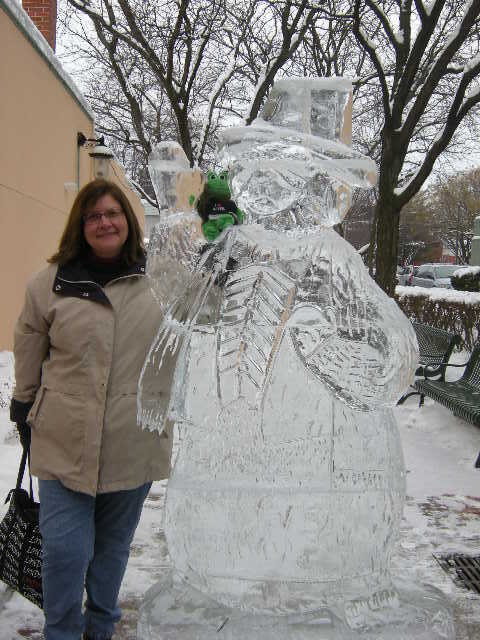 My chilly friend, a groundhog! Every year I get a case of winteritis, so I’m thrilled by this post. I guess there is more to winter than just waiting for spring to come around. Thanks for putting a smile on my face! 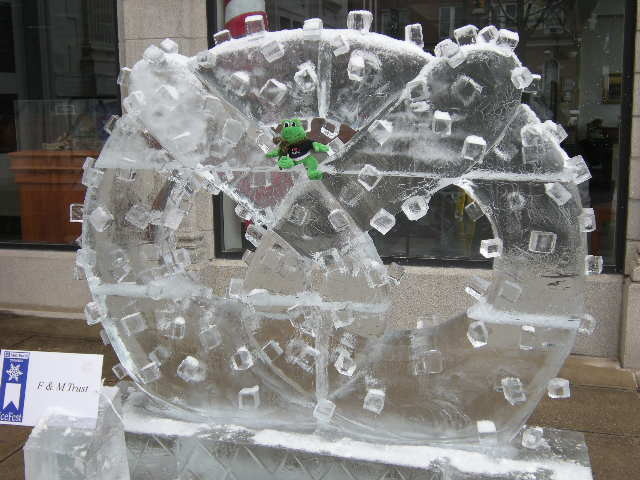 These ice carvings are amazing. The skill it takes to do this is quite incredible. I’m lucky enough to be able to make ice cubes! I really enjoyed this post. Besides the pretzel, did you have any other favorites? We loved this post. It looks like you had a n”ice” time and the weather was okay for winter. We might go see it next year! The wishing well and sunflower (not pictured) were some of my other favorites. 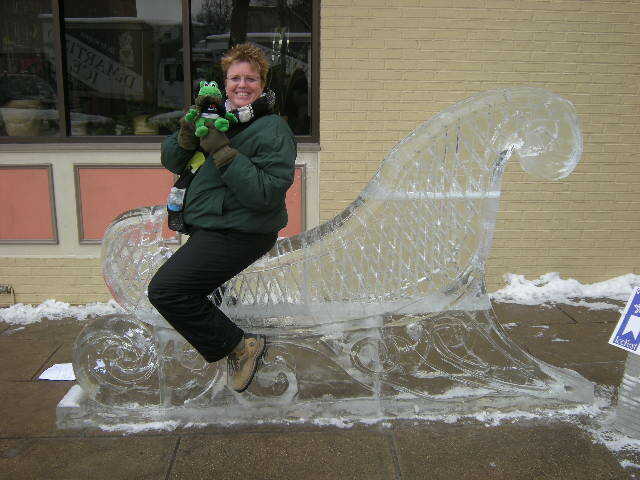 Polly #35…we did have a n’ice’ time! You should definitely go next year. 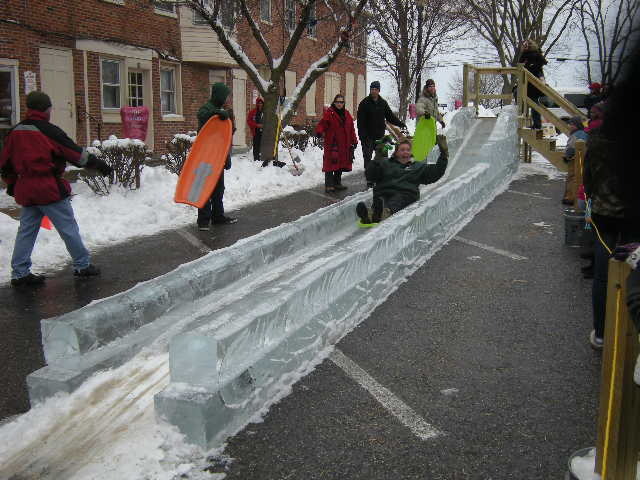 The kids would love the ice slide! This is cool! Sorry about the pun.